Although corals from deepwaters of the U.S. Southeast were first reported way back in the 1880’s, more than a century passed before research revealed the breathtaking scale of the deepwater coral reef ecosystems in the region. Dr. Steve Ross (UNC-Wilmington) and Dr. John Reed (Harbor Branch) have actively partnered with the South Atlantic Fishery Management Council over the past decade to ensure that cutting-edge science is translated into strong protection for these world class reefs. These deepwater reef ecosystems include a dizzying array of mounds and pinnacles covering nearly 25,000 square miles from North Carolina to Florida at depths of 1,000 feet and greater on the Blake Plateau and similar geologic contexts, extending into waters managed by the Bahamas and probably Cuba as well. These reefs are home to tremendous biological diversity, including many species new to science, and including species of potential economic value, both for fishing and for pharmaceutical prospecting. Individual colonies may be thousands of years old, and some mounds likely exceed a million years in age, creating a record of changing conditions in the deep ocean. The Council’s Habitat and Environmental Protection Advisory Panel (which I chair) and Coral Advisory Panel have worked tirelessly with scientists, the Council, the National Oceanic and Atmospheric Administration and fishermen to create proposed protection zones called “Habitat Areas of Particular Concern,” that will protect these treasures against fishing and other threats. In particular, EDF negotiated “allowable gear zones,” where traditional fisheries for deepwater animals (golden crab and royal red shrimp) would be allowed, away from vulnerable tall pinnacles. The Council stands ready to finalize these protection zones at its next meeting in September. 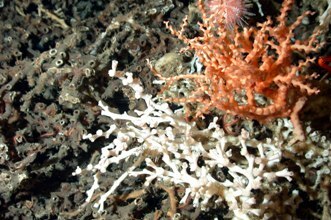 This entry was posted in Uncategorized and tagged Deepwater Corals, EPA, Florida, Georgia, North Carolina, Reefs, South Atlantic, South Carolina. Bookmark the permalink. Both comments and trackbacks are currently closed.